the Right Part. Honolulu: University of Hawai’i Press, 2002. At the end of one of my Chinese Cinema classes, a student asked a question about Crows and Sparrows which we had just watched. “Am I right to understand that China is an agricultural country?” “Yes,” I answered. “They produce a lot of rice there, right?” he continued, and I nodded. “So why did people need a rice ration, and if they had the ration, why should they all rush out to grab the rice? Where had the rice gone?” Such I find are typical questions raised by students, especially those from outside Chinese Studies, when they take Chinese theatre or Chinese cinema as an optional module. In order to understand the culture of China, people ought to know more about China as a country and the historical, political and economic background of Chinese society. I strongly feel that this is a crucial moment to open up Chinese culture to people outside the confines of Sinology. Thus Xiaomei Chen’s Acting the Right Part is a book that must not only be welcomed by Sinologists, but is also much needed by people in the English-speaking world who are interested in Chinese theatre or Theatre Studies in general. Focusing on the period from 1966 to the early 1990s, it affords a vital insight into plays, playwrights and practitioners in contemporary China. Modern theatre is presented as a cultural institution, engaging in Chinese social and political life. Nowhere has the modern Chinese theatre (particularly of this period) been treated to such a thorough discussion in English in the context of “modern Chinese literary and cultural history” and the critical issues of “national identity, mass culture, ethnic studies, and the political nature of cultural discourse” (18). Chen’s starting point is the “marginality” of the study of modern Chinese theatre. As she observes: “modern Chinese drama, owing to its emphasis on audience and mass participation, was deemed too propagandist to count as serious literature.” Moreover, there remains a widely-held presumption that the era of the People’s Republic had “produced no works of ‘literary excellence.’” To redress this marginalization, her strategy is to explore “the cultural and social function of modern Chinese drama”; to discuss the legacy of the first seventeen years of the PRC (1949–1966), a period of which, she argues, the “literary output deserves to be the subject of literary and cultural studies”; and to appraise the value of modern drama as “a significant voice rescued from an even more marginalized era in literary studies—that of Cultural Revolutionary China and early post-Maoist China” (20). 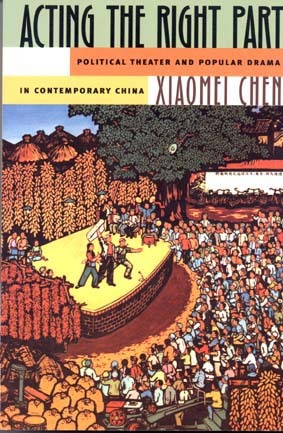 Over the book’s eight chapters, Chen analyses about twenty productions in detail, including revolutionary opera as well as spoken drama works. Depictions of theatrical imagery in revolutionary posters illustrate the discussion, serving to shed light on “a dynamic and dialogic process in which visual culture, model theater, and other performance activities can be seen as integral parts of the political drama of the period” (33). Xiaomei Chen has an exhaustive familiarity with the topic, and is able to illuminate possible meanings as well as synthesize different interpretations and commentary by other critics and practitioners. As a daughter of a prominent theatre family, she came to know Beijing and China through the window of drama. To her, the stage is not merely entertainment but part of her life and her family. She has seen most of the plays that she discusses in the book and uses the comparison of her experiences as a member of the local audience and subsequently as a North American academic, together with the interrogation of her role from the latter perspective, to deepen her understanding of the subject. She makes her position very clear to both readers and herself. Through her “multiple subjectivities,” she helps to create an accessible path to narrate the complicated situation of the theatre in China, and then skilfully brings her readers to a more wide-ranging exposition of the radical changes in contemporary Chinese culture, politics and ideology which generated the theatrical events during those years. Only those who lived through the Cultural Revolution and saw the revolutionary model productions would be able to argue how the new, Chinese, proletarian culture paradoxically and cleverly appropriated the old, Western, bourgeois arts. The discussion of “bare legs display” in the ballet Red Detachment of Women is a good example. Chen inquires into “the cultural and ideological dynamics of Cultural Revolutionary theatre, which shaped—and was shaped by—the political contingencies of China in the 1960s and 1970s.” She feels that the model opera, as a powerful cultural memory, “reveals much about the way a people and a nation envisioned the self, imagined the other, and, in turn, as a result of coming to an understanding of the other, reconstructed the self” (74). 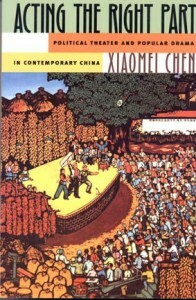 To her scrutiny of both the play texts and performances, she draws an intriguing picture of contemporary Chinese theatre, and explains how and why in 1996, an era of modern consumer culture, a group of university students chose to express their love for the model operas which are imbued with strong revolutionary idealism. Chapters 6 and 7 on Chinese women’s theatre are perhaps the most persuasive. Drawing on her interview notes with Bai Fengxi, “one of the most important women playwrights in contemporary China writing exclusively about women’s issues,” Chen explores both the author’s input and the collective meanings Bai’s characters presented on the Chinese stage in the 1980s. Chen convincingly teases out the complicated political, economic, cultural and ideological transformations rendered during the period, and touches upon the crucial questions of whether or not women’s theatre exists in China, and if it does, what differences there are between the Chinese women’s theatre and that in the West. Her explorations into these questions provide some challenging case studies for feminist theory. In particular, Bai’s earliest play, First Bathed in Moonlight, was not only written by a woman but had an all-woman cast, a woman director, and spoke essentially to the female members of the audience whose response was enthusiastic but eventually “gave rise to subversive readings of the play that far exceeded the original intentions of either the playwright or the performers” (242). The leading actress, who had “striven to create onstage a new woman of socialist China,” became alienated at her unanticipated reception as a negative character and “walked out at the height of the plays’ popularity, after eighty performances” (243). Chen’s analysis of this play and the interpretation of its heroine, and her insights into the reactions of audiences and critics, provide an especially fascinating account. In conjunction with her discussions of the revolutionary opera and spoken drama productions, the illustrations assist greatly in understanding the changing political climate and its influence on staging practices in China. The appendix of selected plays in English translation will prove most helpful for those who teach the subject in the West. Xiaomei Chen is very much present throughout the book and I found her writing technique refreshing in its directness. The author takes full advantage of her “multiple subjectivities” to develop the analysis of modern Chinese drama in a broader geographical, historical and theoretical context, enabling readers to gain a profound knowledge of the subject. Indeed, I myself have learned a great deal from this book. However, on occasion, I felt that her argument of the “marginality” of modern Chinese drama made the author overemphasize the anti-official voice in some of the plays. This might be something to do with her personal experiences during the period, as I share exactly the same passion for these plays and I remember vividly how excited I felt (or perhaps I should use the Chinese expression “rexue feiteng—burning with righteous indignation”) and how I applauded madly together with everyone else in the auditoria when the heroes/heroines bravely confronted corrupt officials. While reading Chen’s book, I tried to examine my own experience: to what extent was it purely emotional empathy? Was it a kind of catharsis or was it an intellectual response? It was too long ago and I don’t trust my own memory; but if we re-read these works, we would find that their tendency to eulogize the Party and their didactic tone were much stronger than any anti-official subtext. I also think we need to distinguish between an “anti-official voice” and a “voice that criticizes officials.” Whereas the former would have been ideologically subversive, the latter standpoint accepted the Party’s leadership and was based on Chairman Mao’s idea of “curing sickness to save the patient.” In other words, for similar motives as had inspired many people to express their candid opinions during the hundred-flower period (for which they were subsequently condemned as “rightists”), those who criticized corrupt officials in their plays in the post-Cultural Revolution period were hoping that the Party would correct its mistakes and rid itself of its bad elements. Generally, the Party’s reputation was kept separate in people’s minds from the opprobrium attached to individual Party figures, and it is fair to say of that period that the majority of people in China, including myself, were grateful to the Party which “had liberated the nation for the second time” and “brought the order [to the country] out of chaos.” So while the writers of these plays were voicing a genuine hatred of the evil within the Party, it is questionable to regard this as anti-official protest. I would suggest rather that such criticism was placed to support the portrayal of the good representatives of the Party and to make the good officials more convincing. The commentary by the playwright of Power Versus Law, Xing Yixun, exemplifies the ultimate objective of these plays: “… I want to eulogize enthusiastically those old cadres who have been loved by the people, and whip those who have violated the law and have been hated by the people.” Facing problems of the abuse of power, bribe-taking and corruption in government, “neither can the people bear any more, nor can the Party tolerate it further. The people hope to change this situation, and the Party also wants to end the problem. Thus socialist democracy and the legitimate system have been brought into a united and extremely important position.” I absolutely agree with Chen when, in a later chapter on women’s theatre, she opposes Roland Barthes’s concept of the death of the author. Her idea that “Feminist studies should, by definition, entail respect for the views and intentions of authors” (238) ought, in fact, to have been extended to her discussion of other plays. The strength of the audience’s response to these plays was a complicated cultural phenomenon, since it was influenced not only by the contemporary political and social situation, but also bore a direct connection to the Chinese tradition of “longing for the upright magistrate, or qingtian.” Xing recorded letters he had received from people who had seen his play: “Many comrades wrote to say: ‘On the stage, I saw the real image of a Chinese Communist Party member.’ Luo Fang ‘touched us’ and ‘encouraged us,’ and he gave us ‘confidence and strength.’ He is the real ‘Upright Magistrate Luo (Luo Qingtian),’ who truly represents the Party’s leadership.’ Other comrades said in their letters: ‘Having seen how Luo Fang stands for justice, not bending laws for relatives/friends, we were so excited and happy. But after arriving at home and thinking about it calmly, we realized that cadres like Luo Fang in real life are too few. Far too few.’ …” I wish that Xiaomei Chen had traced these materials and had further investigated the intriguing complexity involved in these plays. One shortcoming in the book that readers may need to be aware of is that some pinyin transliterations have been misspelled. It is also a pity that Zheng Yi’s interesting Scarlet Memorial is not referenced. “Quan yu fa chuangzuo mantan (How I wrote Power Versus Law)”, in Juben (Plays), 2, 1980, pp.55-58, p. 55.